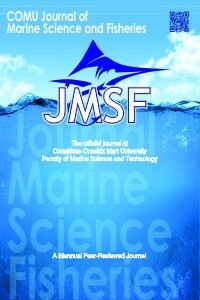 COMU Journal of Marine Sciences and Fisheries (COMU-JMSF) is an open access, international, peer-reviewed journal publishing two issues per year (biannually). The journal does not charge article submission or processing fees. COMU Journal of Marine Sciences and Fisheries (COMU-JMSF) publishes peer/reviewed (double blind) covering all aspects of marine sciences and fisheries including “biology/taxonomy, ecology, aquaculture/feeds/diseases, fisheries biology, fisheries management, fisheries economy, fishing technology, seafood processing, chemistry, microbiology, algal biotechnology, freshwater, brackish and marine environment, inland waters protection and management, pollution and conservation/sustainability” in the form of original articles, review articles, short communications and technical notes.